We have finally done it. The list to end all lists. As the premiere Bartending School in NYC, we thought it was necessary to impart a post that will not only get you more tips while bartending, but will make you everyone’s new best friend. We give you the list of every candy shot and cocktail. The list is broken up into two parts, one with chocolate candy (like the Snickers Shot) and the rest with candy candy (like Bubble Gum or Skittles). While you can learn some of these at a Bartender School, never before have they appeared all in one place. 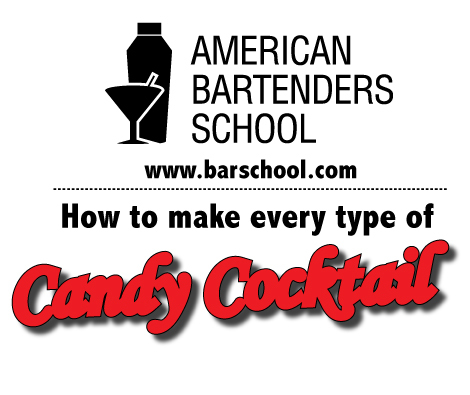 Sign up for Bartending Classes today at American Bartenders School in NYC and you can learn how to master these drinks and keep your customers coming back for more. We will get you a Bartending License and help you find a job! Or click here to jump to the text version. Mr. Murphy’s accomplishments in the entertainment field are remarkable and endless. From his stand-alone performances on Saturday Night Live, to his groundbreaking stand-up specials (Raw and Delirious), to his transition into an international movie star (Beverly Hills Cop, 48 Hours, Trading Places), Eddie has left no stone unturned in his illustrious career. He was even nominated for an Academy Award in 2007 for Best Supporting Actor for his portrayal of troubled soul singer James “Thunder” Early. While he is now focusing more on selectively choosing films and making music, comedians everywhere will tell you that Eddie Murphy remains the funniest person on the planet. We at Stand Up NY congratulate Mr. Murphy on once again being recognized as a true legend of the entertainment industry. College Night at Stand Up NY! Calling all college students looking for quality drinks and entertainment! At Stand Up NY we are hosting a college night this Tuesday, October 27, at 10:15 P.M. College students, even you graduate scholars, show your college I.D. at the door and pay only $5 for your ticket! We will also be offering a unique cocktail of the night at a reduced price, as well as happy hour on all well drinks for $6, with presentation of college I.D. All drinks specials are applicable to guests 21 years or older. Jimmy Fallon stunned Tonight Show viewers Wednesday when he spontaneously “tagged out” in the middle of his monologue. His tag team partner? His predecessor Jay Leno. Leno was met with a roaring applause from the crowd and in return delivered a 3-minute monologue chock-full of old Leno mannerisms. Fallon returned to the monologue to deliver his own take on one of Leno’s jokes. On the way off stage Jay Leno joked, that he needed to leave due to an appearance on Colbert’s show, the rival to the Tonight Show. Leno is in New York City promoting his new show on CNBC, ‘Jay Leno’s Garage’. Notice anything new? Anything? Of course you did! It’s our brand spankin new website that’s almost as beautiful as the Mona Lisa! Our brand new website includes a seamless new menu that allows you to go from checking out our amazing weekly lineup to looking at our new mouth-watering food & drink menu. Don’t believe me? Our new website now offers amazing high definition pictures to show you exactly what you’re getting. Our entire new food menu is now catered to us from the one and only Blondies Sports Bar! Need Information on open mics? Website’s got you. Need a seating reservation? Website’s got you. Interested in making party reservations? Yup, websites got you covered. Want to buy a new dog? Sorry we don’t offer that, but we can offer you the option to buy your tickets straight from your own home! If you’d like to call, email, or even ask a question visit the website today for all the information you need! 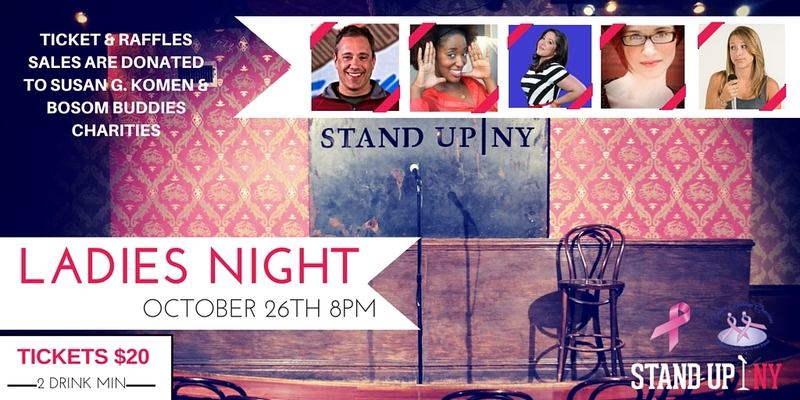 On October 26th at 8PM Stand Up N.Y. is helping fight cancer. A night full of charity and laughs will also include raffles filled with amazing prizes. All proceeds for the event will be donated to Susan G. Komen Foundation & Bosom Buddies. The Susan G. Komen Foundation is boasted as the largest breast cancer research and advocacy program in the United States, helping save thousands of lives every year. The Bosom Buddies is one of the greatest foundations in New York that offers physical, emotional, and educational support for women with breast cancer. The first 25 guests will receive a goodie bag from our sponsors. So come on down to help fight breast cancer and be entertained! The night will feature such amazing comedians as: Bob Dibuono, Gina Brillone, Chlóe Hillard, Adrienne Lapalucci, & many more! To make reservations please call 212-595-0850, email us at laugh@standupny.com OR go online to standupny.com! Stand Up NY Keeps The Beer Train Rolling! Exciting news coming your way & forgive me if you feel side effects from this blog such as: drooling, increased interest to drink all the Shipyard Pumpkinhead Beer & Not Your Father’s Root Beer in stock, intense passion to attend every show at Stand Up NY just so you can drink all the Shipyard Pumpkinhead Beer & Not Your Father’s Root Beer, & allergies (I mean, it is the fall after all). Just this week a fresh, glistening, & tempting shipment of Shipyard Pumpkinhead Beer & Not Your Father’s Root Beer arrived at Stand Up NY just for you! Now I want you to close your eyes imagine sitting in a room where your ears are filled with the jokes of the best comedians in New York City and your holding in your hand a glass of the most refreshing thing you have ever drank. Now open your eyes! Did you imagine yourself in a perfect dream world?! Well that world is possible at Stand Up NY! So hurry before too many people read this blog and run down to experience the bliss they experienced while probably reading this blog in their underwear looking up the nearest places to by Shipyard Pumpkinhead Beer & Not Your Father’s Root Beer! Remember, Stand Up New York has shows every night of the week. To make reservations please call 212-595-0850, email us at laugh@standupny.com OR go online to standupny.com! Last week, 30 Rock alumnus Judah Friedlander showed up to Stand Up NY for two amazing performances, as he gets ready for his book release later next month. The highly accomplished comedian and actor has been honing his expertise in the industry for more than 25 years now, much of it as a New York native since moving from his hometown of Gaithersburg, Maryland. Nominated for an Independent Spirit Award in 2004, Friedlander has adorned himself to audiences with unforgettable roles in shows and films such as 30 Rock, American Splendor, Curb Your Enthusiasm, and Date Movie—all to go along with his truly unique and enigmatic persona on stage, working as a national headliner for years. The “World Champion” also has a number of late night credits to his name, including The Daily Show, The Tonight Show and Last Call With Carson Daly. All of those aside, the comedian isn’t done lengthening his résumé just yet. His new book If the Raindrops United will be in bookstores starting Tuesday, October 20th. The book follows his 2010 authorial debut How To Beat Up Anybody. Keeping in step with its creator, the book is truly one-of-a-kind, featuring drawings and cartoons done by the comedian himself. A hilarious preview for the book is available on Friedlander’s website here. He’s one of our personal favorites at Stand Up NY, so we strongly urge you to grab a copy of If The Raindrops United when it hits stores October 20th. To pre-order If The Raindrops United, click here. Ho-hum- another week goes by, another star of the comedy industry stops by to entertain the crowd at Stand Up NY. Coming off of a month that included special guests like Jay Pharoah, Jackie Mason and George Wallace, September began with Saturday Night Live star Pete Davidson stopping by twice last week. Born in Staten Island, Davidson has recently shown a comedic acumen far beyond his years, as last year he became the first ever member of the SNL cast to be born in the 1990s. Now truly defining his position in ranks of comedy’s best, Pete has appeared recently on a number of TV shows, including Guy Code, Brooklyn Nine-Nine and recently in a raucous appearance on the dais for the Comedy Central Roast of Justin Bieber. Despite his youth, Davidson has performed on the institution like a seasoned veteran, garnering high praise for a number of hilarious appearances, including perfectly timed pieces on Weekend Update with Michael Che and Colin Jost. His easygoing demeanor and far-beyond-his-years vulnerability onstage have endeared him to audiences across the country all before his 22nd birthday. Twice last week, our audiences were treated by surprise performances by Pete Davidson, so they could see firsthand what the industry at large already has- he is the next big thing in comedy.